With peace returned to Europe in 1945, William Lyons could focus on producing cars again. For obvious reasons, he could no longer use the ss brand name used before the War, but with the already frequently used 'Jaguar' he had another strong brand name. The first production models were very similar to the late 1930s line-up and featured two four cylinder and one 3.5 litre six cylinder engines. This gave Lyons' engineers some time to develop a complete new sportscar with a state of the art engine. Initially two versions were planned, but the four cylinder model was abandoned and all the focus was on the new six cylinder. The engine's development team was headed by William Heynes, but he was helped in no small part by Walter Hassan and Claude Bailly. They came up with a straight six cylinder engine displacing just over 3.4 litres. 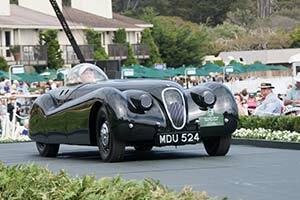 Unlike the push-rod and side-valve engines previously used, the new 'XK' featured twin overhead camshafts. In street tune the engine was good for 160 bhp and in competition spec with the compression increased to 9.0:1, the six cylinder happily developed 180 bhp. Both versions used a twin SU Carburetor setup. Power was fed to the rear wheels through a four speed gearbox, bolted directly to the engine. Just like the new Mk V model introduced a few months earlier, the sportscar used Jaguar's new box type chassis, but with a simpler and lighter construction. Suspension was by wishbones and torsion bars at the front and a live axle with transverse leaf springs. Lockheed drum brakes were fitted all around. The brand new package was covered in a simple, but very elegant two seater roadster body. Lyons planned to build only 200 examples of the new sportscar and the very first examples featured hand beaten aluminium body panels. Dubbed the XK120 after its claimed top speed of 120 mph, Jaguar's new sportscar debuted to much acclaim at the 1948 Earl's Court show. Not surprisingly the public's positive reaction led to the introduction of a production model, but problems with getting the moulds for the steel body right delayed the full time manufacturing of the XK120 until the second half of 1950. In the mean time the proposed 200 aluminium bodied cars were produced and due to the popularity another 40 were completed. These proved particularly successful in racing and in 1949 a virtually standard car achieved a speed of 126.594 mph to prove the type indication was not an overestimation.